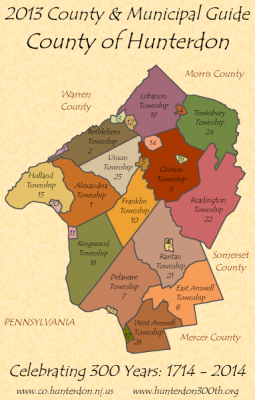 Hunterdon County New Jersey is nestled in the fertile Delaware River Valley, is comprised of 26 municipalities-14 townships, 10 boroughs, one town, and one city and much of the county is rural and picturesque, with rolling hills and charming country towns. Clinton, with its historic mill, is an artist's mecca. The County's many recreational and cultural attractions make it a popular vacation destination. Hunterdon is one reason New Jersey is so aptly called "The Garden State." Hunterdon is also part of the Middlesex-Somerset-Hunterdon tri-county area, one of the fastest growing sections of New Jersey. It is a bedroom community located within easy commuting distance to New York City, Philadelphia and Allentown, Pennsylvania. Many businesses and individuals attracted by this combination of beauty and accessibility are moving to the County. Hunterdon is the home of numerous international corporate headquarters and has some of the best outlet shopping in the country.